The 1977 Dodge Royal Monaco two-door hardtop carried a $5,126 price tag. The biggest Dodge in the clan returned for its fourth year on the same body shell. There were minor changes. Riding on its well-established 3 0861-millimetre (121.5-inch) wheelbase, the Grand Monaco was a vast land yacht. The four-door models weighed in at more than two tonnes. Royal Monaco models carried the 5.2-litre (318-cubic inch) V-8 as its base engine. 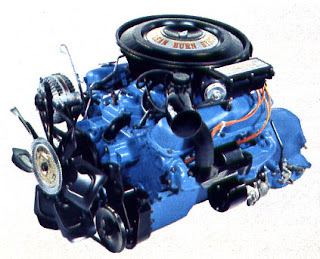 That power was coupled to Chrysler’s tried-and-true TorqueFlite automatic transmission. 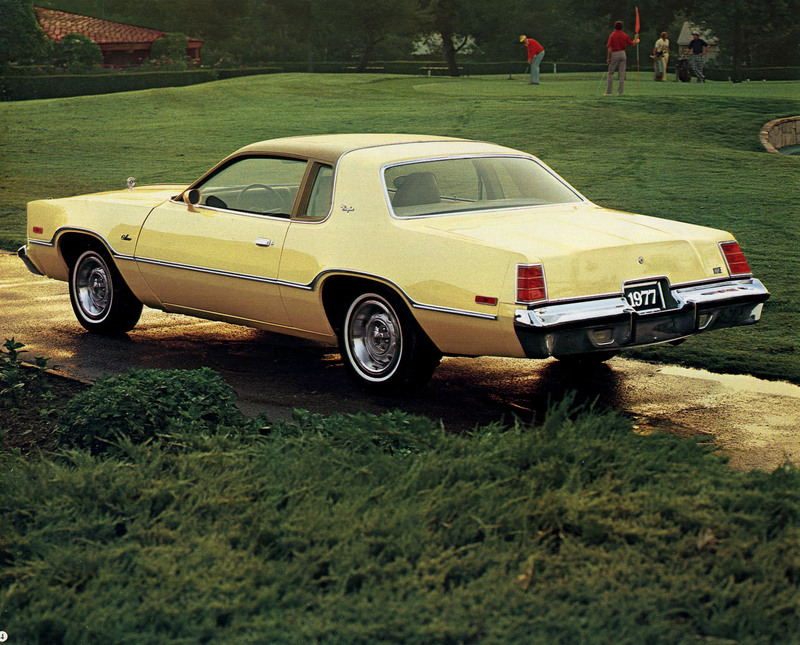 All Royal Monaco models were sourced from Chrysler’s factory in Belvedere, Illinois. 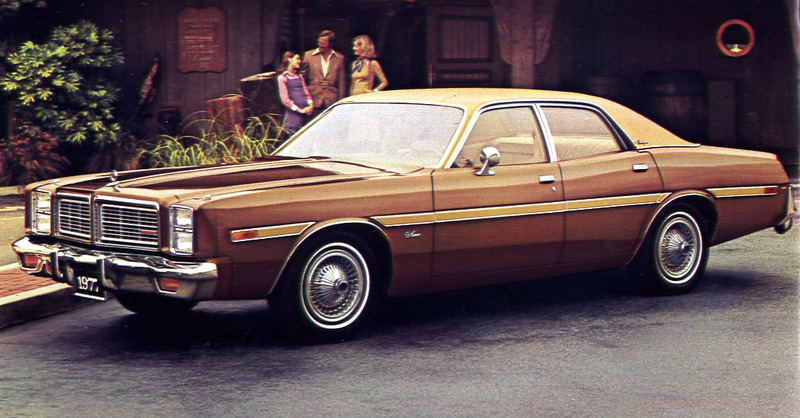 The 1977 Dodge Monaco was last year’s Coronet. The intermediate Brougham four-door sedan with the six-cylinder engine listed for $5,491, f.o.b. Windsor. In a surprise move, last year’s attractive intermediate Coronet name was dropped though the car itself was continued on its 2 921-millimetre (115-inch) wheelbase. The big difference was that the intermediate line was rechristened as the Monaco. 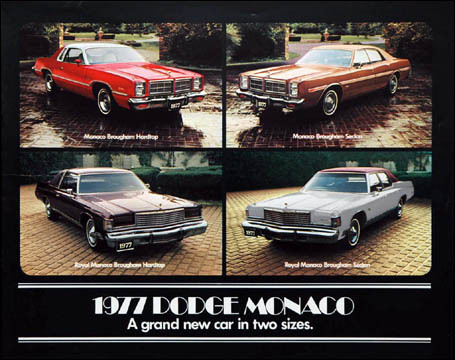 Dodge Monaco models were imported from the Lynch Road plant in Detroit. Monaco was a slippery package to look at with its long deck and short, crouched-cat rear. Monaco carried a perfect Coke-bottle swell in the rear quarters. Stacked halogen quad headlamps accentuated the split grille that featured crosshatch openings. A stand-up hood ornament topped the hood. From the rear, large trapezoidal taillights were imbedded in a massive bumper. 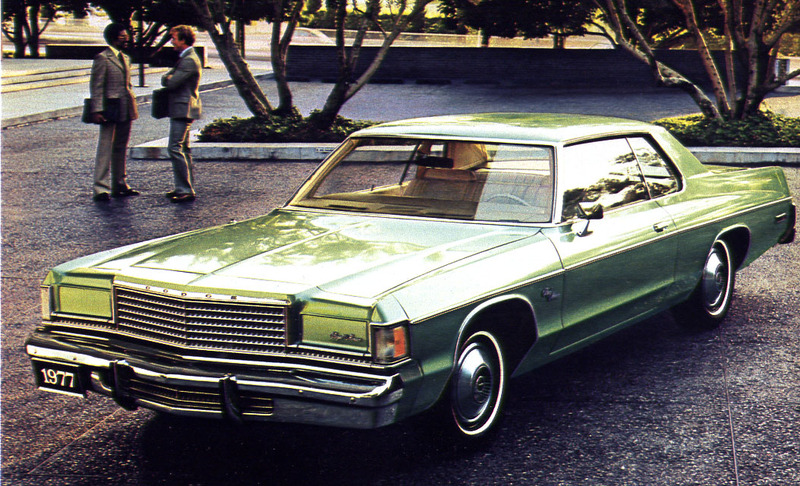 The 1977 Dodge Monaco could be ordered with the optional 6.5-litre (400-cubic inch) or the 7.2-litre (440-cubic inch) engine with Chrysler’s Electronic Lean Burn system. The Monaco was delivered with the two-barrel Super Six engine a.k.a. the “slant six” and a three-speed manual transmission. Many chose to spend the extra bucks for the 5.2-litre V-8 mill, adding automatic transmission and power steering while they were at it. 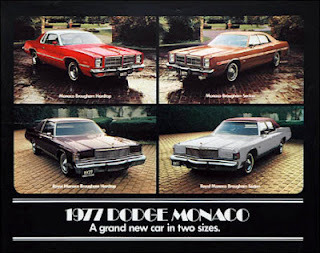 The Monaco name meant more attention to detail the Dodge intermediate. Interiors were finer than before with a combination of cloth and vinyl seating. There was a centre armrest on the Brougham. Monacos were kissed with colour-keyed carpeting throughout and that was upgraded to genuine shag carpet in the Brougham. This 1977 Dodge Royal Monaco two-door hardtop carries the exclusive and posh extra-cost Diplomat dress-up package. The Royal Monaco was “for those who like traditional value and comfort with an added touch of luxury in a full-sized automobile.” It was square, boasting an egg-crate grille and hidden headlamps at the fore and large rectangular tail lamps set deep in the rear bumper. In the biggest Dodge the 5.2-litre (318-cubic inch) V-8 loafed under the massive hood. 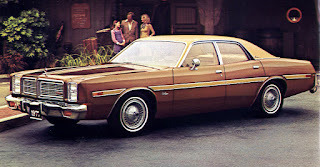 Chrysler’s TorqueFlite automatic transmission, fibre-glass-belted radial ply tires, power steering, power front disc and rear drum brakes were all standard equipment.” The Royal Monaco Brougham upped the ante to the 5.9-litre (360-cubic inch) V-8. With a sticker price of $5,409, f.o.b. 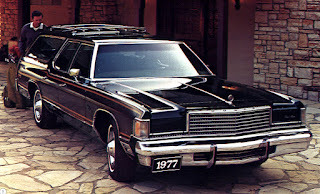 Windsor, the 1977 Dodge Royal Monaco four-door station wagon was the most expensive Dodge in the stable. Colours for Monacos and Grand Monacos were Vintage Red Sunfire Metallic, Jade Green metallic, Burnished Copper Metallic, Firest Green Sunfire Metallic, Mocha Tan, Moondust Metallic, Russet Sunfire Metallic, Coffee Sunfire Metallic, Eggshell White, Black Sunfire Metallic, Jasmine Yellow, Silver Cloud Metallic, Golden Fawn, Mojave Beite, Cadet Blue Metallic, Spanish Gold Metallic, Starlight Blue Sunfire Metallic and Wedgwood Blue. Monaco models could also be had in Bright Red and Inca Gold Metallic was reserved for the Royal Monaco. Roofs could be decked with full vinyl, Halo vinyl, Canopy vinyl with opera window or a padded landau roof that included a 12-centimetre (five-inch) wide “Over the Top” stainless steel band at the front edge of the padding. 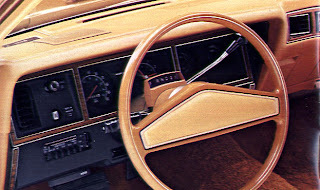 Instrument panel of the 1977 intermediate-sized Dodge Monaco was simple and straightforward in design. One could customize one’s Monaco with air conditioning, tinted glass, a Sure Grip axle, a 100-amp alternator, a 500-amp battery, an electric clock (digital available on the Royal Monaco), a rear window defroster, door-edge guards, floor mats, the Fuel Pacer System, locking gas cap, dual horns, dual remote-control outside mirrors or Dual Sport remote-control outside mirrors, power steering (standard on V-8 models), power brakes, power windows, power door locks, power bench seat, power bucket or 60/40 split-back seat (driver side only). Then there was entertainment. An AM radio could be ordered or an AM/FM radio or an AM/FM stereo with or without eight-track tape system and even a rear speaker. One top of all that one could have a sun roof, a tilt steering wheel, a luxury steering wheel, a trunk dress-up kits for the sedans, undercoating, deluxe wheel covers, premier wheel covers or genuine chrome-styled road wheels. For the wagon one could order a luggage rack, a rear bumper step pad, assist handles and an air deflector. If ordering options was confusing, one could order numerous options brought together in specific packages. 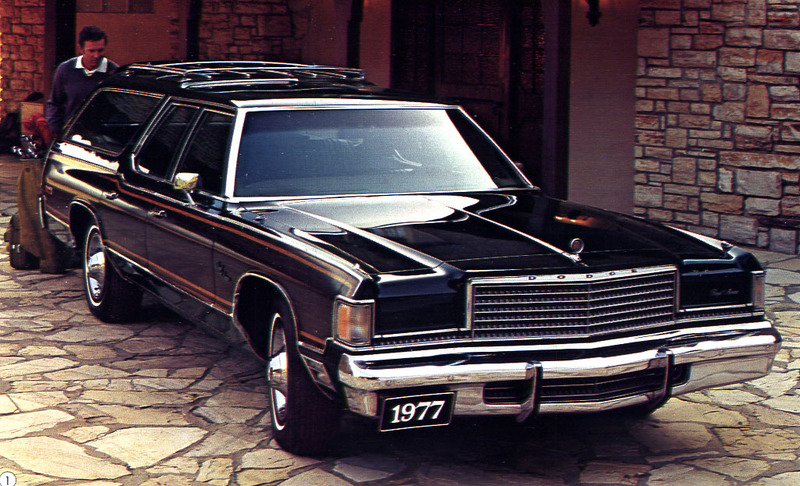 There was the Easy Order package, the Light package, the Deluxe Insulation package, the Luxury Equipment package, several Light- and Heavy-Duty Trailer-Towing Packages (good for wagons), the Roadability Package and for the Royal Monaco Brougham, an exclusive Diplomat package. Combined sales for the Dodge Monaco and Royal slipped to 8,160 units for the 1977 calendar year. That was off considerably from the Coronet 12,579 units and the 11,244 full-sized Monacos delivered in 1976. Consumers visiting Dodge showrooms were far more interested in the compact Aspen, taking home 34,025 of the sassy compacts—making it the fifth best-selling nameplate in the country.